You have to love all the awesome new species that the Dubai Aquarium & Underwater Zoo brings…the latest addition is a Giant Pacific Octopus. 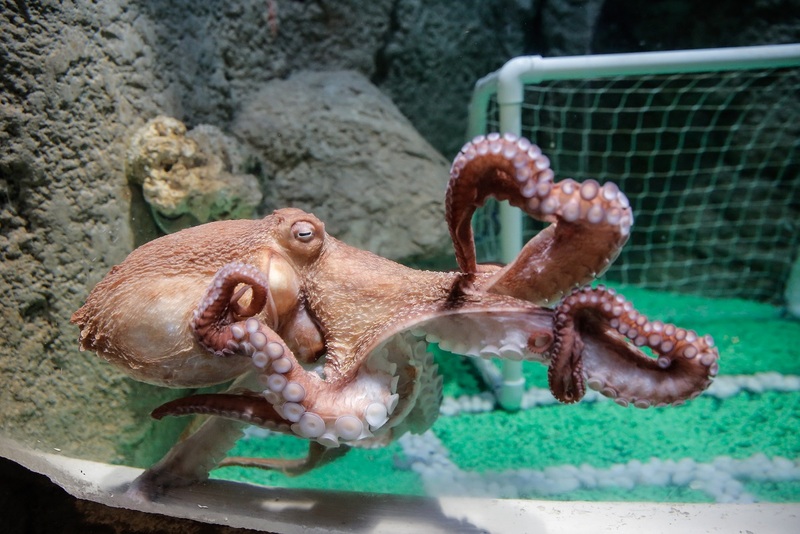 Giant Pacific Octopuses (Enteroctopus dofleini) are found in the North Pacific Ocean and is the largest species among Octopus, reaching 4.3 meters in height and weighing more than 70 kg. The Giant Pacific Octopus has almost no bones allowing it to slip into very tight crevices to reach for food or hide from predators. Its head contains all vital organs including three hearts, while the rest of the body essentially constitutes eight arms. They have excellent eyesight and can taste with their tentacles. Being one of the most intelligent invertebrates, they can work out puzzles and will remember a route through a maze after only a couple of attempts. They are also masters in disguise, being able to change colour and texture of their skin using specialised skin cells. Dubai Aquarium & Underwater Zoo, managed by Emaar Retail LLC, features a 270-degree walkthrough tunnel. Underwater Zoo, located on Level 2 above the main aquarium tank, presents the bio-diversity in different ecological zones including Rainforest, Rocky Shore and Living Ocean. Apart from Humboldt Penguins and Caiman Crocodiles, the animals featured here include Piranhas, Giant Spider Crabs, Small Claw Otters, Sea Jellies and Clown fish.